Jack Price, of Price Rubin & Partners, announces the introductory performance of the Grammy-nominated National Symphony Orchestra of Ukraine’s U.S. tour at the Armstrong Auditorium. This is a golden opportunity to hear the leading symphonic organization of Ukraine, which is the most recorded orchestra located in any former Soviet territory. Jack Price, founder of Price Rubin & Partners and concert pianist formerly known as Dickran Atamian, announces the U.S. tour of the distinguished National Symphony Orchestra of Ukraine. The Price Rubin artists will kick off their tour on Thursday, March 9, at 7:30 p.m. at the Armstrong Auditorium on the campus of Herbert W. Armstrong College, 14400 S. Bryant Road, Edmond, OK, as part of the Armstrong International Cultural Foundation Performing Arts Series. Formed in 1918, the National Symphony Orchestra of Ukraine has a storied history. It has collaborated with most of the major conductors, composers and soloists of the 20th century, including music directors Natan Rakhlin, Fedor Glushchenko, Theodore Kucharand Volodymyr Sirenko; legendary guest conductors Stokowski, Markevitch, Sanderling, Mravinsky, Kondrashin and Rozhdestvensky; and famed soloists Rubinstein, Menuhin, Stern, Oistrakh, Richter, Rostropovich, Gilels, Kogan, Kremer and Carreras. The National Symphony Orchestra of Ukraine was also entrusted with the premier performances of the works by Shostakovich, Khachaturian and Lyatoshynsky. Since 1993, it has toured worldwide and has released more than 100 sound recordings on Naxos, Marco Polo and Brilliant Classics, receiving the highest international acclaim, including two Grammy nominations. 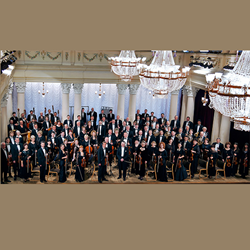 To purchase tickets for the National Symphony Orchestra of Ukraine performance at the Armstrong Auditorium on March 9, please visit http://www.armstrongauditorium.org/performance/national-symphony-orchestra-of-ukraine. Jack Price helps artists develop their individual market branding and career milestones. The Price Rubin & Partners staff makes thousands of calls every month to decision-makers who are in charge of talent acquisition for concerts, corporate events and fundraisers. They offer real-time reporting where artists can see their campaign (which is personally supervised by Jack) unfolding second by second. Price Rubin stands for transparency and accountability in artist management today. For more information, please call (310) 254-7149, (PRI) CER-UBIN or visit http://www.pricerubin.info.